Water lies at the intersection of landscape and infrastructure, crossing between visible and invisible domains of urban space, in the tanks and buckets of the global South and the vast subterranean technological networks of the global North. 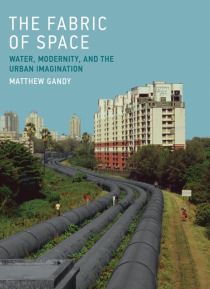 In this book, Matthew Gandy considers the cultural and material significance of water through the experiences of six cities: Paris, Berlin, Lagos, Mumbai, Los… Angeles, and London. Tracing the evolving relationships among modernity, nature, and the urban imagination, from different vantage points and through different periods, Gandy uses water as a lens through which to observe both the ambiguities and the limits of nature as conventionally understood. Gandy begins with the Parisian sewers of the nineteenth century, captured in the photographs of Nadar, and the reconstruction of subterranean Paris. He moves on to Weimar-era Berlin and its protection of public access to lakes for swimming, the culmination of efforts to reconnect the city with nature. He considers the threat of malaria in Lagos, where changing geopolitical circumstances led to large-scale swamp drainage in the 1940s. He shows how the dysfunctional water infrastructure of Mumbai offers a vivid expression of persistent social inequality in a postcolonial city. He explores the incongruous concrete landscapes of the Los Angeles River. Finally, Gandy uses the fictional scenario of a partially submerged London as the starting point for an investigation of the actual hydrological threats facing that city.